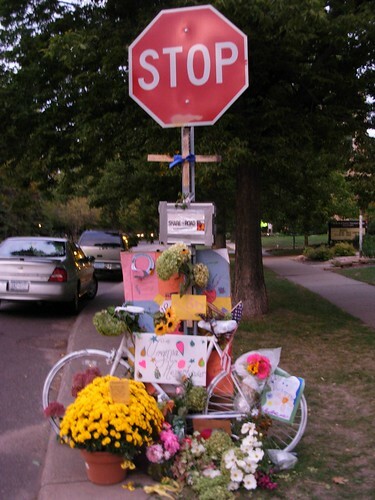 Heuer, Virginia M. She died tragically September 27, 2008, as the result of a car/bicycle crash. She was born June 10, 1957, in St. Paul. She graduated from Alexander Ramsey High School, Roseville, and attended Bethel University where she earned a degree in theater and Biblical studies in 1979. As a singer and actress, she toured with the USO and performed in many community theater productions and was co- founder of the cabaret group “A Touch of Class”. An active member of Roseville Lutheran Church, she sang in the choir, worked with drama, participated in and led mission trips to Norway and Slovakia, and was set to travel to Africa in October. She loved life, laughter, good food, good friends, her work, her church, and her family. She was passionate about anything she did, and loyal to family and friends. She leaves a huge hole in the world of all who knew her. She was preceded in death by her father, Eugene Heuer, Jr.; and her aunt, Carolyn Hoffman. She is survived by her husband of 26 years, Jeff Bowar; mother, Marilyn Heuer; brother, David (Aija) Heuer; niece, Samantha; and nephews, Brian and Daniel. She was a freelance film producer in the Cities for over 25 years, and was working at Target in the broadcast division at the time of her death. Please make memorials to Roseville Lutheran Church or Feed My Starving Children.